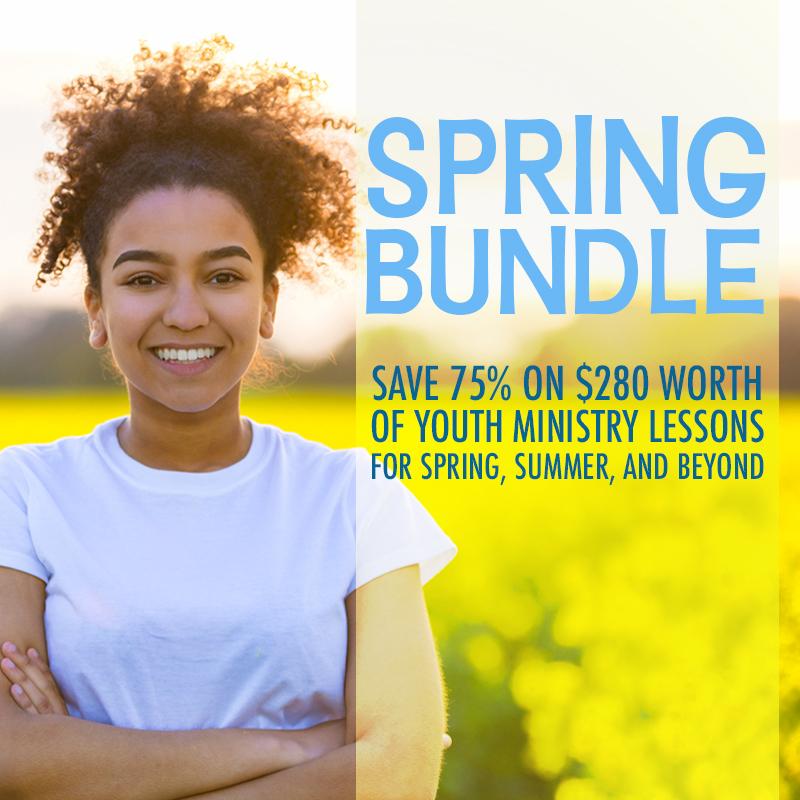 Here at Ministry to Youth, we are all about saving you time and money. A lot of youth ministries have either NO budget or a TINY one, and many have to close that gap by fundraising or other creative methods. I’ve even heard of youth leaders who fund the ministry with their personal money (and there’s not a lot of that to go around). No doubt, this is a commendable sacrifice on their part. That’s why our team is passionate about creating FREE lessons and games. We actually pay a team of youth ministry leaders (and editors) to make sure ALL our free stuff is really awesome. 3 youth ministry lessons for 6th-12th grade on: Spiritual Growth (Matthew 13:1-9); Anger (Proverbs 29:11) and Comparison (Philippians 4:10-13). 4 youth group games for 6th-12th grade on: Popularity (Proverbs 29:23); God’s Word (1 Thessalonians 2:13) and Self-Esteem (1 Corinthians 6:19-20). 3 junior high lessons for 6th-8th grade on: Character (Philippians 1:11); Humility (James 3:13); Armor of God (Ephesians 6:11) and Worry (Matthew 6:34). 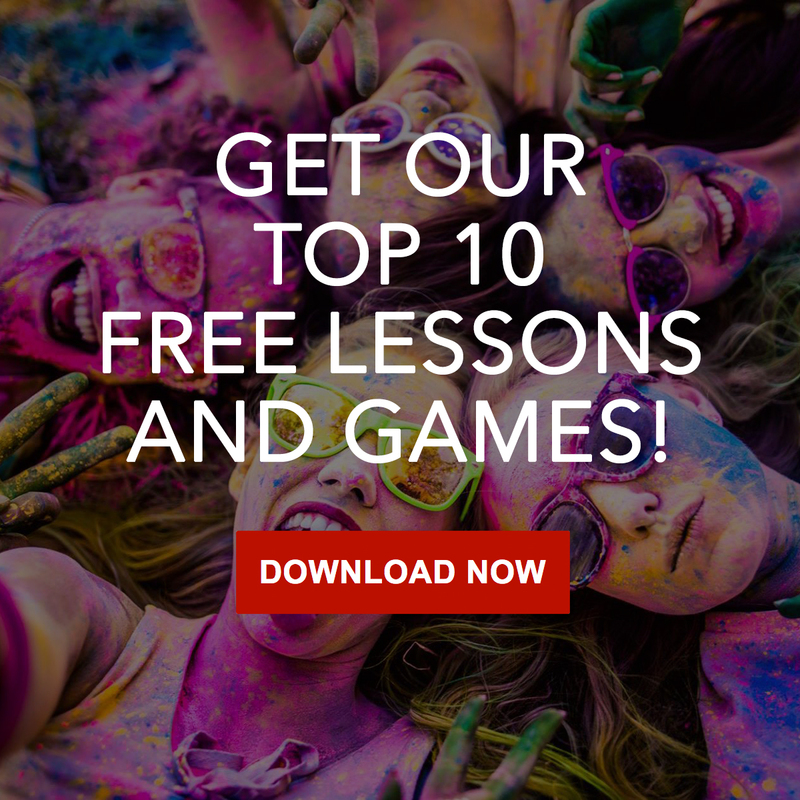 Another way we save you money is by creating bundles of paid lessons and games. They usually give you a 50%-75% discount on 6-8 months of lessons and/or games. 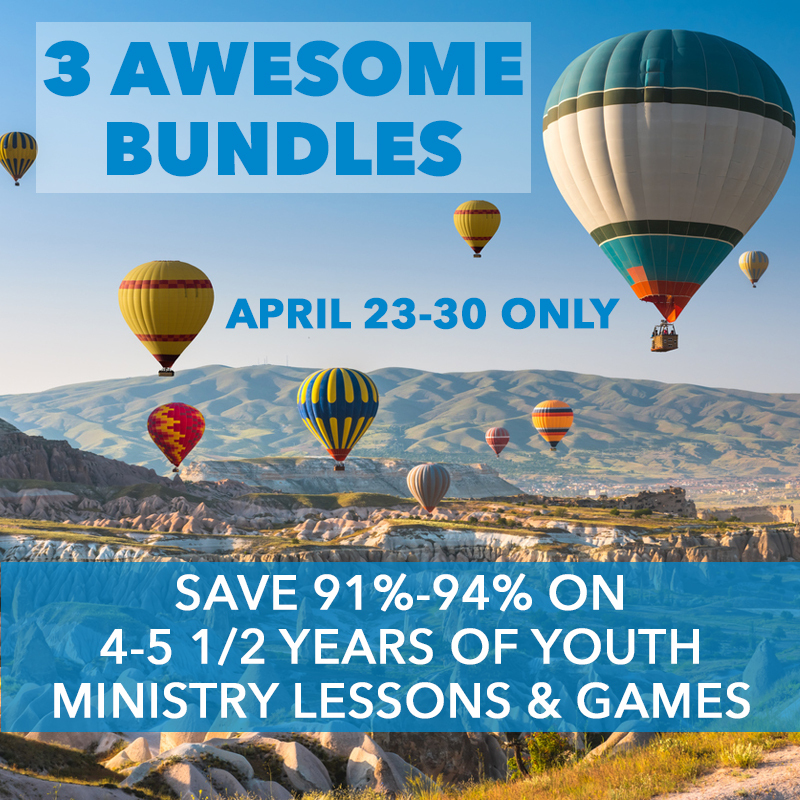 Then, a few times a year we release an insane bundle for a limited time with a 90%+ discount on 4 years of youth ministry lessons and games. I know. Pretty awesome, right??!? Back in the early days of ministry, I was young and single. I spent just about all my time doing ministry related stuff: planning events, building relationships with students, coordinating weekend services, recruiting/training volunteers, etc. I was also a full-time seminary student. I had a passion for pointing students to Jesus and being a part of what God was doing in their lives. I eventually graduated from seminary, fell in love with my wife Jena, got married and had three kids pretty close together in age (all about 1 1/2 years apart). 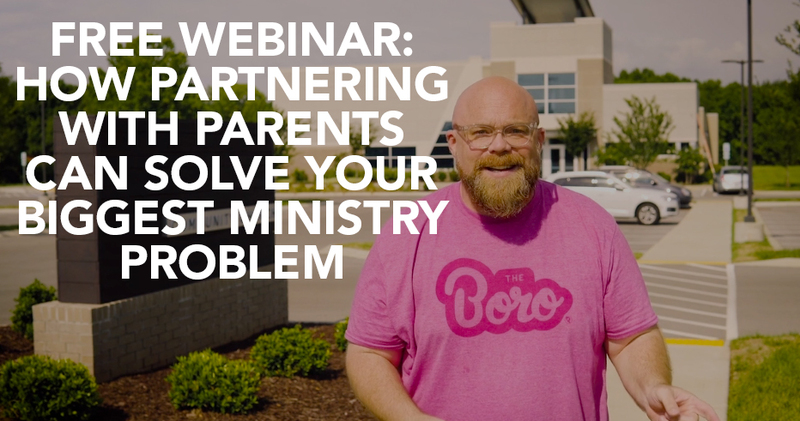 Juggling the needs of a young family and ministry were difficult. I struggled for years with trying to balance the two. About 5 years after graduating seminary, I took 1 ½ years off of full-time ministry and transitioned into another non-ministry job. Then, I went back into full-time ministry. I learned a lot about boundaries during my time off and was able to maintain ministry/family/life balance in my new ministry role. The truth is that full-time youth ministry leaders are in the same boat. I thought when I went from part-time to full-time ministry that I would FINALLY have time to get everything done. But that was an illusion. Ministry goes on non-stop, year round, and never seems to slow down. Again, this is where we come in. We save you time because you don’t have to create lessons and games from scratch. We hope that you’ll reinvest that time to focus on other important things that are required of you. Like building relationships with students, volunteers and parents. Or whatever else is a priority to you. Thanks for allowing me to give you a bit of background behind why we do what we do. I hope you enjoy all the freebies. Good morning, I absolutely LOVE your lessons and the games. I am always looking for ‘newer’ material that is in line with today’s youth. The problem is that too often some material moves away from the Word of God, because they are trying to be too funky and appealing to our Youth. Thank you for keeping God’s Word the most important. May you be blessed in your Ministry, and through this create Disciples for our Lord. Shanty, thanks for the kind words. Glad you found our lessons and games helpful! !